She was only 24 when The Delta Sweete was released, yet shed already sold three million copies of her debut single Ode To Billie Joe, a controversial song about teen suicide. Gentry was brimming with confidence to write The Delta Sweete in 1968 as a concept album of life in the rural south. No country singer, let alone a girl, had put out an album without a single in mind. The Delta Sweete was a "suite" of songs about life on her grandfathers dirt-poor farm in Chickasaw Countys Mississippi Delta. Her formative years were by all accounts impoverished. "We didnt have electricity," she said in an interview, "And I didnt have many playthings." Her intention was to bring the listeners into the country, to church (Sermon), at a family gathering (Reunion) or down by the river (Okolona River Bottom Band, Louisiana Man). When Ode To Billie Joe came out in the summer of 67, people talked about the song and wondered about the unsolved mystery of his suicide. Suddenly the south was remembered again, from Choctaw Ridge to the Tallahatchie Bridge, a place and time forgotten in the rush for modern living, became alive. But the south shaped a person differently. On The Delta Sweete, Gentry comes across as tough and pragmatic, without the daintiness of a Southern Belle. Her dark hair, well-sculptured features and dark eyeliners reinforced her inner strength. She had to be to have convinced her label to allow her to attempt a concept album and also write eight of the 12 songs. No obvious singles could be heard and for covers, Gentry included Al Dixons Big Boss Man, Mose Allisons Parchman Farm, John Loudermilks Tobacco Road, all tough blues and perhaps as a concession, the pop country of Doug Kershaws Louisiana Man. Her own songs measure up well against these tried and trusted standards. The suite opens with a party band chooglin on the river in Okolona River Bottom Band. Its a happy affair with Gentry bending words to great effect, rhyming "majority" with her own inventions like "barr-edy" and "come as you are-edy". It showed an inventive flair to challenge country music with pop music conventions. But when you hear a rasping, leering man laughing in the background, the strangeness throws you off. It reveals itself in the next track, Al Dixons Big Boss Man, traditionally seen to be about life on a plantation down south with the boss whippin your back. "You got me working, boss man/ workin round the clock/ I want me a drink of water/ You wont let me stop". Gentry overhauls the song. At the final verse, she throws away the ambiguity in the song. She goes down low and sings "Can you hear me when I call? / You aint so big, you just tall, thats all". The innuendo reveals the sexual politics in the song. When the night comes, the slave girls are the masters. And all he ever did was shoot his wife." But she also has a soft side to her. Her fun side devoted itself to childish things and sometimes-outright fantasy (Refractions). She could purr a lullaby like Jessye Lisabeth but add drama to make an adult listen ("What secret are you keeping Jessye Lisabeth? Pray tell/ What could cause such bitter tears? What lesson has life taught you?"). Her talent as arranger is best heard on Reunion, where she sings a duet with an unidentified male voice with chorus lending support. Its set at a family gathering where the effect of hearing the two voices interjecting with the chorus brings to mind such reunions as affairs where everyone is talking but no one is listening. Two more beautiful songs hold up side two. Penduli Pendulum has her singing at her most moving about the predictability of a pendulums swing. How everything that moves forward must swing back again: "Pendulum, like perfect rhyme/ Always in predicted time/ Penduli, when will I learn/ Departure means a sure return". Courtyard, the only love song on the album, closes on a fairy-tale note. A country girl wishes for her lover to fulfill his promise to build her a courtyard in their country mansion "with a white marble fountain" and a "lacy, iron gate". The last verse "patterns on a courtyard floor/ Illusions of all Im living for" is Gentrys dreams on the edge of illusion. She was a pop singer, songwriter, arranger, and a multi-talent at a time when women were not appreciated for having too much talent. She later revealed shed "originally produced Ode To Billie Joe and most of (her) other records". But in the 60s "a staff producers name was nearly always put on the records." 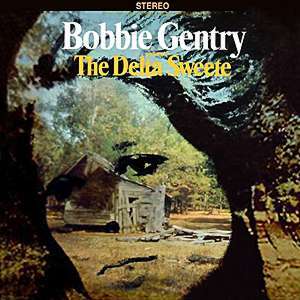 The Delta Sweete remains missing on CD since it first came out, as is Bobbie Gentry. She married thrice, the first time for three months, the second for a year and the last for enough time to birth her only son, Tyler. She retired in 1980 and has not been seen since. Some suggest she is in California working as a teacher. Unlike myths about Jim Morrison or Elvis deaths, Gentry is still alive but hidden from sight, making her the more elusive. She came to fame shrouded in the mystery of Ode To Billie Joe. People have analysed the lyrics to suggest why he committed suicide. Two movies have been made, suggesting he was homosexual, the latest was Kelly Reichardts Ode, a black & white narrative on gay sexuality, repression and teen suicide. I understand he was your fiance, what a tragedy." or how about a satin brocade, guaranteed not to fade or maybe youd prefer another shade, trim in gold or silver grey?" "You can take comfort Ms Morgan/ he is where we all want to be." It fails. "Why are you laughing at me? Dont you believe in eternity?" The door creaks open and Ms Morgan steps out as the music swirls us back to lifes carnival. Gentry wrote the whole song with a cameras eye for detail and contained it under three minutes. Casket Vignette was taken from her third album, the first to feature pop song covers. It was the first breach, the first concession that led her down the road from artist to a Las Vegas billboard. Along the way, there were some fine songs, but later albums were all compromised with her vision of the south slowly chipped away.